Sorry…if you want the dark and snarky…go over the other “Post.” But if you want a nice story of a task well-done…read on. The other day I got a call from Domenic, a young man who works at an Assisted Living Facility in town. 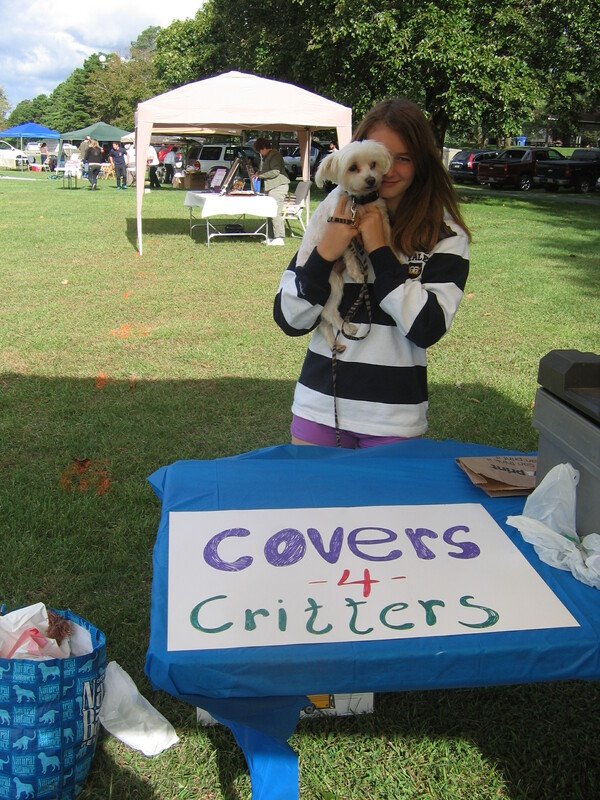 He said that someone had given him a flyer they had taken from a booth I had sponsored for Covers for Critters at our local Dog Fest event last September. 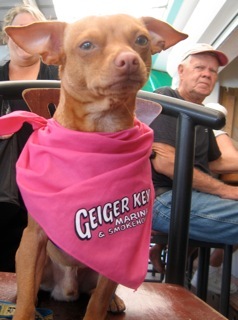 Dog Fest is a terrific event held here each year, sponsored by the Brick Township Rotary Club. (See post of May 1, 2011 for details). Domenic asked if I was still interested in receiving old bedding, towels and sheets, etc. for a local Animal Shelters. I said I was, but I also recalled that back in October another facility had offered, only to go back on their promised donation due to a “management decision” that said these items were needed elsewhere. Domenic assured me it wasn’t them (there are many establishments of this type in my town) and I told him I would be there early the next morning. 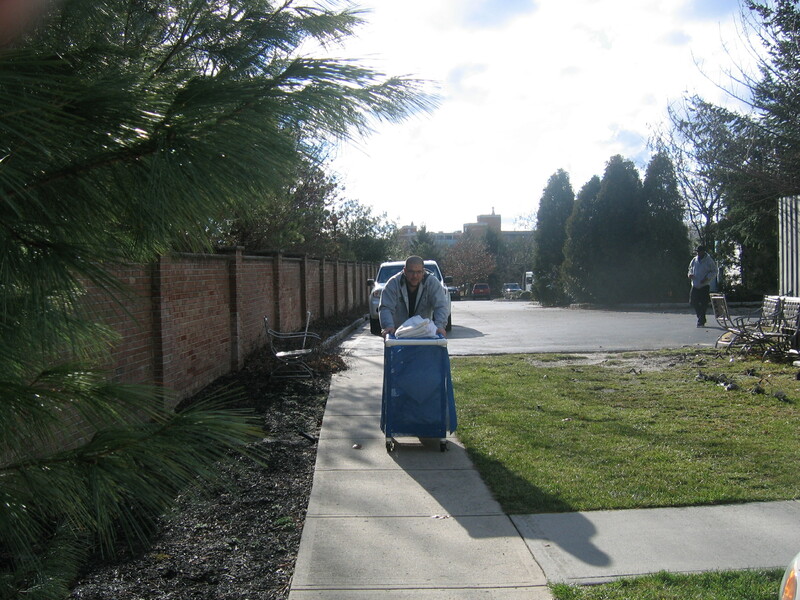 When I pulled into the lot, there he was with his helper, John, cleaning out a shed. 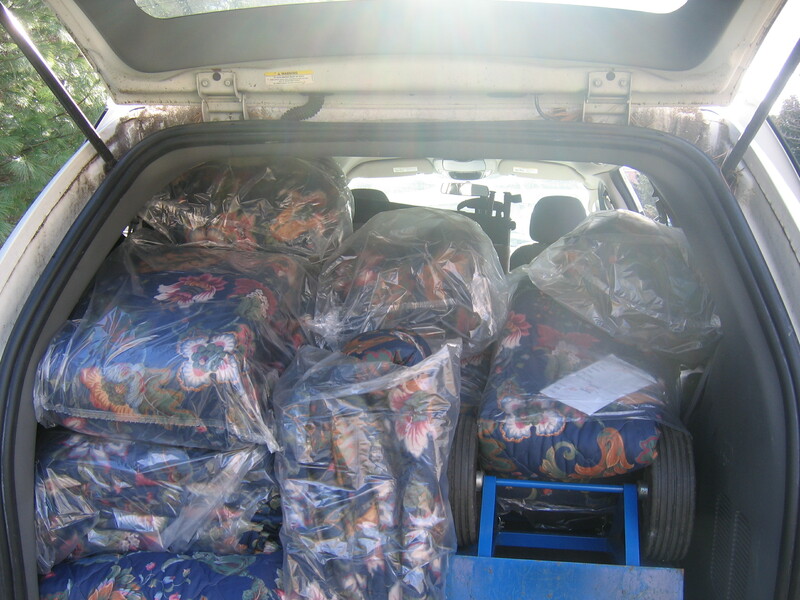 They told me to back in my van and proceeded to load it up with unused bags of bed comforters. 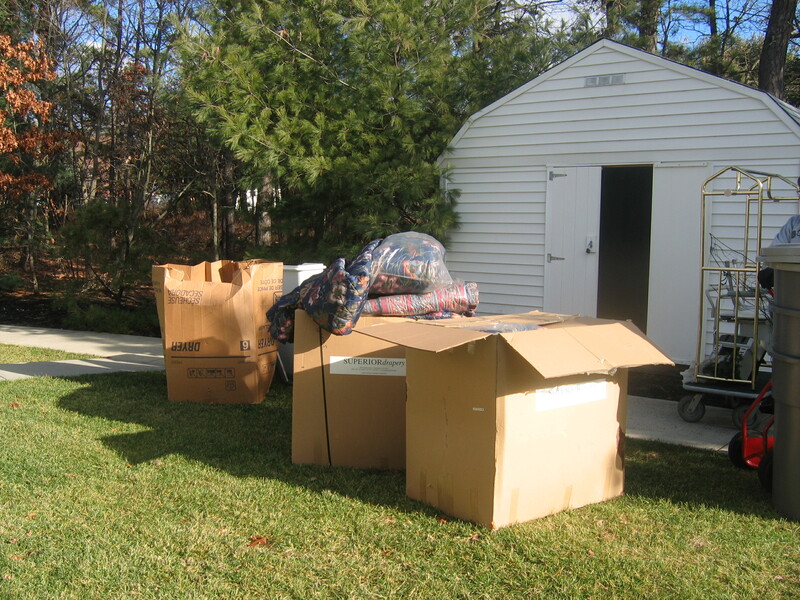 He then asked if we needed sheets and I said I would gladly take them…. I thanked him for taking the time and making the effort to contact after almost three months had gone by…he said he was a dog lover and hoped to have more for us in the future. In the coming weeks, I am planning a special two-year anniversary post and then hope to present the forces behind the Ray of Hope Program of Kansas City http://hsgkc.org/rayofhopepage.html and a young man named Sean Martin who started the Kids Adopt a Shelter Campaign on Facebook https://www.facebook.com/#!/KidsAdoptaShelter as well as some other individuals who are using their time and talents to make some lasting and significant changes in the way our Companion Animals are treated. Happy New Year’s all and thank you for your quiet support. 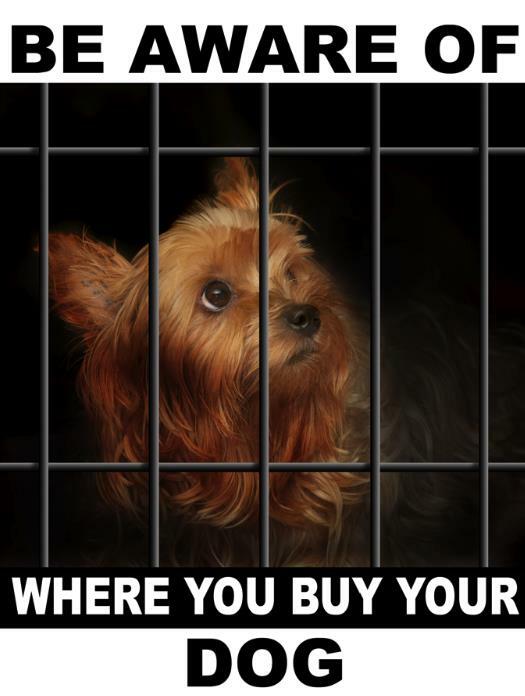 Be Aware of Where you get your Dog…. As one who writes about special days, weeks and months, it is perfect that the year ends with something called Awareness Month of Awareness Month Months (seriously). For example, December brings the serious, World Aids Month and Colorectal Awareness Education Month; it is Rising Star and Spiritual Literacy Month, Bingo’s Birthday Month and Operation Santa Paws Month. Throughout the year, there is a month dedicated to all food groups, beverages, diseases and things we probably never even thought to be aware of. In the past couple of years, I’ve spent a lot of time making people aware of National Dog Week (the last full week in September) and the way this week can present a time of organized reflection about issues affecting our Companion Animals, specifically dogs. Of course, these issues are relevant every week of the year, but perhaps there is one issue that should be addressed on the occasion of a week filled with two important gift-giving holidays, Hanukkah and Christmas. If you, or someone you know, is planning to add a dog to the family unit at this time please read on. One way of achieving awareness is to talk to someone who is knowledgeable about a subject that is important to you. In the case of puppy mills and pet shop dogs, I sought the experience of Jacki Flannigan. I became aware of Jacki and her work on Facebook. This dog-advocate began arranging Peaceful Protests in front of Retail Pet Shops after watching a special program produced by Lisa Ling for the Oprah Winfrey Show about the horrors of puppy mills. Jacki was struck by the fact that Lisa stated that of all the documentaries she had produced for her Oprah Specials, this was the one that had the most profound effect on her. Jacki, who now lives in Pennsylvania, arranges planned Peaceful Demonstrations outside pet retailers in New York State. She recruits participants through her Facebook Page and makes the carefully worded signs for the Protesters to carry. She does not wish for confrontation, but wants to make the public aware of what is going on behind the doors of these innocent looking Pup Shops. Jacki talks about the terrible lives the parents of these puppies must endure. The pup you buy at these stores might turn out to be physically and emotionally okay, but there is a high price to be paid (apart from the amount of money the buyer will dole out with an average 300 percent markup on the price of puppy). Interesting, Jacki’s first “event” was held on Christmas Eve to dissuade those who think popping into the pup shop for a last-minute canine-centric gift might be a good idea. In my local newspaper the Asbury Park Press this evening, a woman wrote a Featured Letter to the Editor titled, “Choose breeder or shelter when adopting a puppy.” In it, Janice Fisher of Manasquan, NJ, makes some excellent points. Of these retail pups she notes, “…Their pathetic lives will be solely for the purpose of reproducing. They will not know a warm bed, human touch, a dog bone or exercise.” These dogs will never leave their cage and will be put down, often inhumanely, when deemed no longer productive. Janice rightfully points out that these shop owners will tell you that they only buy from USDA licensed kennels, assuring that these pups are top-quality when the Animal Welfare Act only provides for, “a minimal standard of care.” They will also say they don’t buy from puppy mills (duh) but they do buy from Brokers who buy from the mills. Fittingly, the photo at the top of this post pleading for Awareness serves as Jacki’s Profile Picture. There is so much more to write about on this topic, but if this brief post makes you Aware, then my writing, and this Awareness Month of Awareness Month Months wrought something positive. Wishing you a very insightful and inspiring year. Thank you for taking time to read. 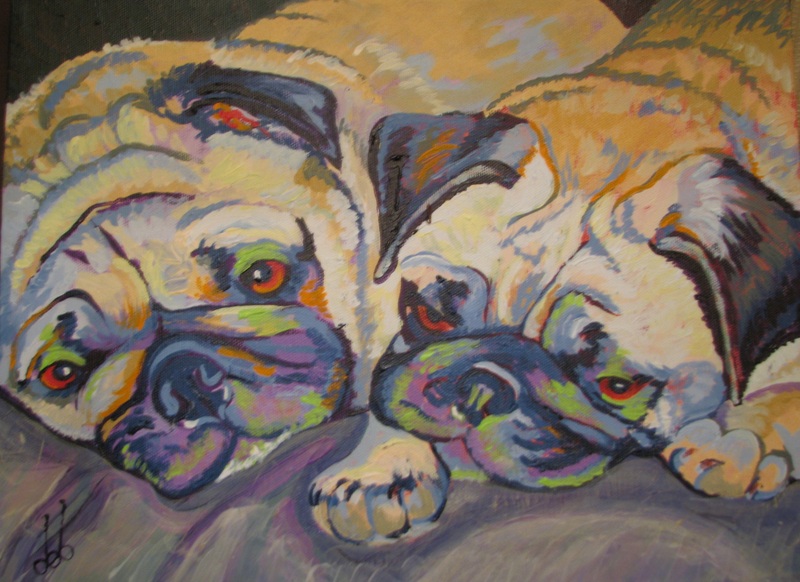 Pugslee and Princess Haddock are the subjects of Donald Brown's Painting, "Furry Cuteness." Just want to take a moment at a busy time of year to make you aware of some fun activities surrounding the National Dog Week Community Page and Project. If you haven’t already, please go over to our Facebook page https://www.facebook.com/pages/National-Dog-Week/218596591491974?ref=ts and LIKE us to be eligible for some specially selected give-aways and to be part of a nice dog-centric community. December proved to be personally exciting for me as a writer. My Short Story Collection, Something’s Lost and Must be Found received some nice recognition when it was the Book-of-the-Day on December 5 http://ereadernewstoday.com/book-of-the-day-somethings-lost-and-must-be-found/679420/ and was included in Tracy Riva’s List in the Midwest Book Review. I appreciate all who have taken time to read and review on my AMAZON PAGE. This book was inspired by the work I have been doing on behalf of National Dog Week. 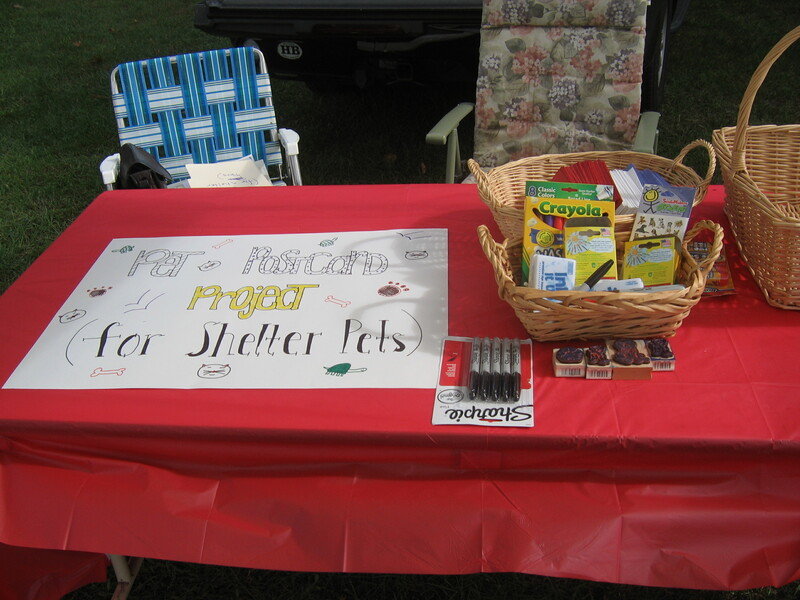 A portion of all proceeds will be donated to a group I support Project Pets – Spay, Neuter, Love https://www.facebook.com/#!/pages/Project-Pets-Spay-Neuter-Love/160594203971240. Back on the NDW Community Page, a name was selected from the LIKE List in November and Robin Rudnitsky Jacobs of New Jersey won a bottle of B.Animal all-natural dog shampoo generously donated by Evelyn Colom Kiggens. http://banimal.com/shop/ Thanks again, Evelyn. This month, those who LIKE and post a photo of their dog(s) dressed up in holiday attire on the NDW Face book page will be eligible to win a copy of CHASING BOCKER’S TALE, a terrific book about a very special Labradoodle named Bocker. This book was generously donated by Bocker’s Mom. To learn more about his book please check out and LIKE their Facebook page at https://www.facebook.com/#!/ChasingBockersTale. 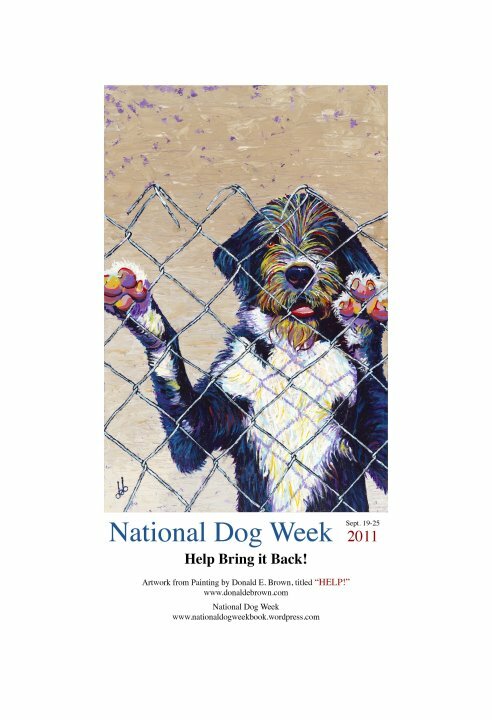 Donald not only donated his time and talents for the Contest, he loaned that fantastic image of Sergio for the National Dog Week Poster 2011. He also created several posters, signed twenty of them and sold them (and several unsigned) to raise funds for the Baja Animal Sanctuary. Amanda and David Haddock of Iowa, our lucky contest winners, are thrilled with the results, (see top of page) confirming, “We received the painting and it looks great. We are so happy our cute kids got painted…Thank you we appreciate all you and Don Brown did.” I love the dreamy quality of this painting, the use of color and the way it really captures the expressiveness of the breed. 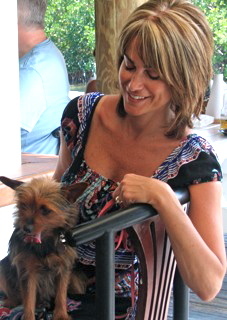 We thank Amanda and David and their dogs for being such devoted friends of the NDW Community, too! I would also like to thank Dr. Patrick Mahaney, our NDW Pet Consultant who continues to help spread awareness of National Dog Week and Reality Television Host and Dog Advocate Laura Nativo for helping us out while promoting her show that aired in September Dog Park Superstars. And thanks to all of you who continue to read and participate in some meaningful causes. I hope to have more good news early in the new year.